Plan of Improvements of Beach Street Park. This is a scarce 1871 map of Tribeca Park or Beach Street Park, New York City by Kellogg and Pilat. 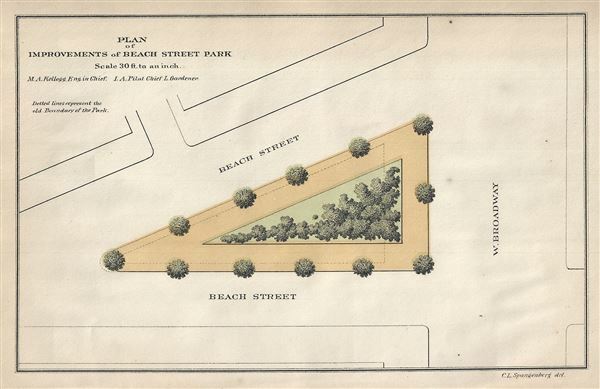 It shows the plans of improvements of Beach Street Park, located between Beach Street and West Broadway. The location of trees and shrubbery is noted within the triangular park. Originally part of the Lispenard Swamp or Lispenard Meadows, the park was named after Beach Street, itself a corruption of the name 'Paul Bache' the son-in-law of Leonard Lispenard. The original designs of the park, prior to this plan which is part of the Department of Parks Annual report, remain unknown. In 1985, the park became known as Tribeca Park from its surrounding neighborhood of Tribeca (Triangle-Below-Canal Street), one of the most desired neighborhoods in New York City.